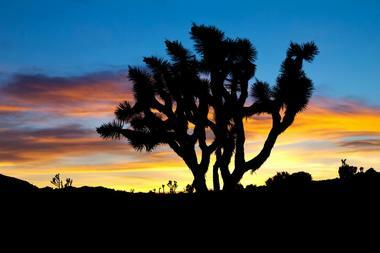 Joshua Tree National Park encompasses almost 800,000 acres in Southern California. The area is infinitely variable, seeming unwelcoming and sometimes brutal during summer. However, the land is actually quite fragile and delicate. Climate extremes, torrential downpours, and strong winds shaped the park's land, although the rain is unpredictable and sparse. The survival of the animals and plants that live within the park relies on their whole ecosystem. During the area's more flourishing times, members of the Pinto Culture, among the earliest inhabitants of the Southwest, lived in the Pinto Basin that is now dry. Indians later left behind pottery ollas and rock painting as evidence of their presence in the desert for harvests of cactus fruit, pinyon nuts, and mesquite beans. Cattlemen then arrived in the desert in the late 1800's. Dams were built by the cattlemen for water. Miners soon followed them in a quest for gold, leaving behind the Keys Ranch, Desert Queen mine, and Lost Horse mine. Homesteaders arrived in the 1930's in search of an opportunity to start their lives anew and free land. Today, however, people visit the desert in search of blue skies and tranquility. 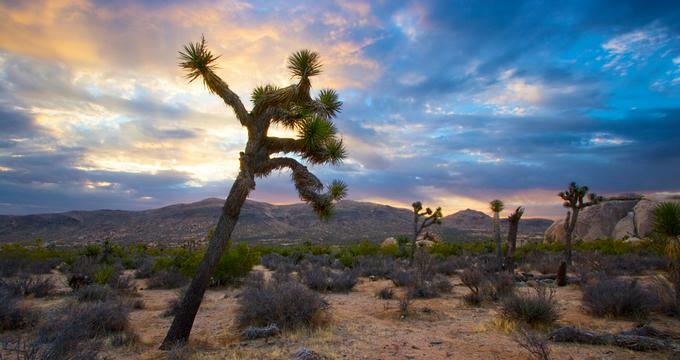 Two expansive deserts come together at Joshua Tree, CA, and elevation primarily determines their ecosystems. 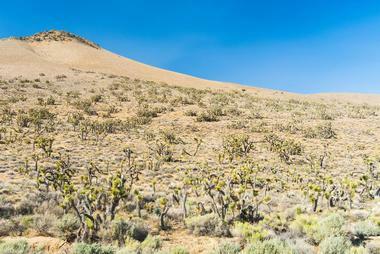 It's difficult to find an area that more vividly illustrates the differences between "low" and "high" desert. Part of the Sonoran Desert, the Colorado Desert is 3,000 feet below and occupies the park's east half. The creosote bush is abundant throughout the desert, and small stand of cholla cactus and spidery ocotillo can also be found in the arid landscape. 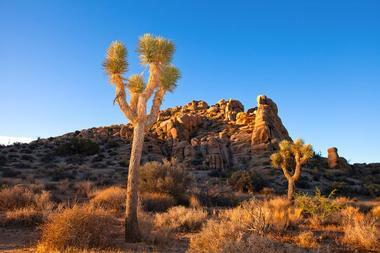 The wetter, slightly cooler, and higher Mojave Desert is the unique habitat of the Joshua Tree. These undisciplined trees can be seen extensively throughout the park's western half. Oases offer a dramatic contrast to the arid sea of sand. Indicative of the few areas in the park where water naturally occurs are five fan palm oases. The park also contains several fascinating geologic formations, such as exposed granite monoliths and jagged mountains of twisting rock. These acts as a testament to the for extraordinary forces of nature that helped to shape this land. Desert varnish, aplite, playas, gneiss, aplite, pediments, arroyos, bajadas, and alluvial fans together create a beautiful and complex mosaic. The plants in the desert often appear to have given in to the hot and sometimes ruthlessly dry environment. These plants, in fact, lie dormant as they wait for moderate weather and rainfall to trigger their growth, painting a profusion of colors through the park. Many unfamiliar animals appear in the desert during the night and the edges of daylight. They wait for the cooler nighttime temperatures, and burrow, crawl, hop, and run the slow time of desert life. Golden eagles and bighorn sheeps can be seen under the blue sky and bright sun. 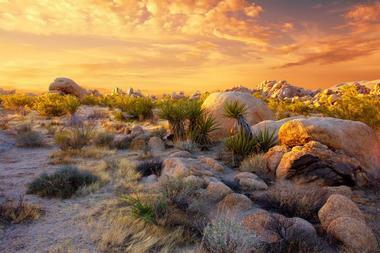 Black Rock Canyon can be found in the northwest corner of Joshua Tree National Park. The road leading to the area ends at a campground. At the Visitor Center, situated in the campground's center, campers can register and pay camping fees. The staff here can assist visitors in planning a hike or other activity. Nature guides, books, maps, and activity books for children can also be bought at the Visitor Center. Located at the mouth of the canyon on a hillside, the campsites are surrounded by an array of desert shrubs, cholla cacti, junipers, and Joshua trees. 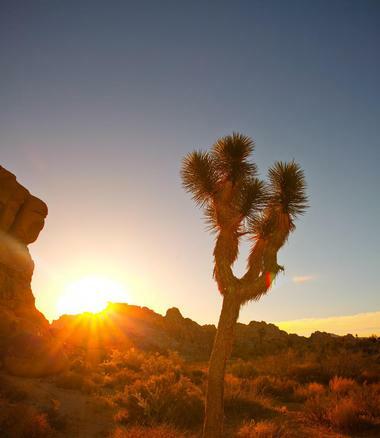 In the springtime, late February brings blooming Joshua trees followed by annuals and shrubs through May. The family campground is typically quiet and offers a good introduction to camping for those who have never done so before. Every campsite includes a fire ring and picnic table with water and restrooms nearby. A separate area for horse owners to camp or stage a ride is also provided at the campground. Wildlife viewing is possible from the Black Rock Canyon campground, with sighting being frequent. Cottontails, jackrabbits, and ground squirrels are often encountered by visitors. Bighorn sheep, mule deer, and desert tortoises, while more elusive, have also been spotted in the campground area. Cactus wrens, roadrunners, scrub-jays, great horned owls, and Gambel's quail are frequently seen by birders. If a birder is lucky, they may even spot a pinyon jay, LeConte's thrasher, or a Scott's oriole. There are also many hiking trails that can be found behind the campground. Among those is the High-View Nature Trail, a scenic walk that's 1.3 miles in length. For hikers seeking longer trails, Warren Peak, Panorama Loop, and Eureka Peak travel to ridge lines that overlook the frequently snowy peaks of San Gorgonio and San Jacinto. Also found at Black Rock it the trailhead for a part of the California Riding and Hiking Trail. Backpackers wanting to do an overnight wilderness trip can register at the backcounty board. One of Joshua Tree National Park's best kept secrets, the Cottonwood Spring Oasis, is only seven miles from the park's southern entrance. The spring is an effect from earthquake activity, and was used by the Cahuilla Indians for centuries. The Cahuilla Indians then left behind clay pots, or ollas, and bedrock mortars in the Cottonwood Spring area. Cottonwood Spring became a significant water stop for teamsters, miners, and prospectors. Several gold mines were constructed near the oasis due to the necessity of water to process gold. Near the spring, visitors can see what's left of an arrastra, a more primitive gold mill. Concrete ruins of two other gold mills that existed later can also be seen. Several hiking trails start at Cottonwood Spring. A three-mile loop trail that leads to Mastodon Peak provides fascinating geology and excellent views, as well as the Winona Mill Site and Mastodon Mine. A short trail takes hikers to what's left of Moorten's Mill through desert will and palo verde trees. Another short trail leads to a dry falls and past a second oasis as visitors walk down the easy Cottonwood Wash path. Red-spotted toads and rushing water can be seen at the falls during wet years. Bighorn sheep are often spotted during the early hours as they come for water. The Lost Palms Oasis trail is a much longer hike, eight miles total round trip, and offers the park's largest stand of fan palms. Cottonwood Spring is also among the best spots in Joshua Tree National Park for birding. Visitors should bring a pair of binoculars and sit for a while. Half a mile along a trail from the spring is a campground. Shaded picnic tables, restrooms, and water are all provided at the campground. Many of Joshua Tree National Park's largest pinyon pines, junipers, and Joshua trees are found near the Covington Flats' dirt roads. The dirt road running through Covington, located in the park's northwestern section, is 3.8 miles long from the picnic area in Covington Flats to Eureka Peak. The road, while steep close to the end, provides views of the Morongo Basin, surrounding mountain, and Palm Springs from the top. 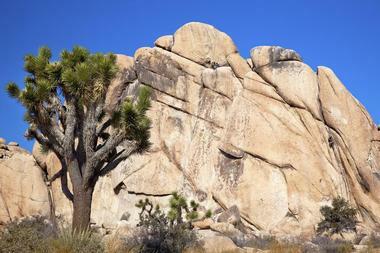 The area is situated between Joshua Tree and Black Rock Canyon. Several trails are available in the Coving Flats area, as well as opportunities for backcountry camping. Indian Cove in Joshua Tree National Park can be found north of the Wonderland of Rocks, 10 miles west of Twentynine Palms, and thirteen miles east of Joshua Tree Village. The Indian Cove Road ends at the secluded cove, which is known for its extensive number of shrubs and mature Mojave yuccas. Set against the sand-colored rocks, the colorful flowers in the spring are particularly striking. Several different species of bird can be seen in Indian Cove, including possible sighting of the elusive LeConte's thrasher. Throughout spring and early fall, desert tortoises can sometimes be seen. Towering rock formations enclose an expansive campground, causing the Indian Cove area to be popular among rock climbers. Several of the campsites offer naturalistic tent camping, as some are tucked around the rocks. There are also camping areas for groups and those with RVs. At the Indian Cove entrance, there is a ranger station where campers can register and get water if needed. On the east side is a picnic area, while on the campground's west side is the Indian Cove nature trail. The trail is half a mile long and features seasonal Indian occupation of the area, animals, and plants. Joshua Tree National Park's popular Keys View offers spectacular views of the Coachella Valley from its position on the crest of the Little San Bernardino Mountains. It may take twenty minutes down Keys View Road to get to the viewpoint, but it is well worth the drive. Visitors can either walk the 0.2-mile trail the provides some excellent views, or use the wheelchair accessible route. The Salton Sea's shining surface, 230 feet beneath sea level, can be seen to the far left from Keys View. To the right, are the Peninsular Ranges' high points, San Jacinto and the Santa Rosa Mountains. Even further right is the San Gorgonio Mountain, its snowy peak easily visible from Keys View. The ridge's southwest side, the San Andreas Fault, drops in elevation about a mile into the Coachella Valley and can be seen below. This fault runs through the valley, stretching from the Mendocino Coast above San Francisco to the Gulf of California. a total distance of 700 miles. On a very clear day, it's possible to maybe catch a glimpse of Mexico's Signal Mountain. Skull Rock's existence began quite some time ago in Joshua Tree National Park, when raindrops collected in small depressions. These raindrops then started eroding the granite. As rock was eroded, even more water collected in the depressions, which lead to additional erosion. Over time, what looks like two hollowed-out eye sockets were formed, causing the rock to start to resemble a skull. Skull Rock can be found along the main park road that runs east to west. Across the amphitheater within Jumbo Rocks Campground or right across from the campground's entrance is the beginning of a nature trail that travels 1.7 miles.